Small burns, stacked up along the inside of my right forearm, from reaching around the hot iron when I’ve placed it wrong on my work table. No sooner does one heal when I hit it just wrong, again, and get a fresh one. Real seamstresses have these and are proud of them! 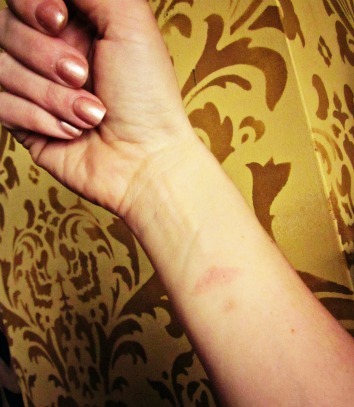 Some women have burn marks from the oven racks while pulling pans of cookies…I’d rather have the iron marks! Ditto–I still have a scar from the time I just let my wrist go limp for a second, for no apparent reason at all, while I was holding my iron up and it was on the linen setting. Good times. Ouch! For me, it’s sticking myself CONSTANTLY with pins. The ones I can see clearly and the ones I forget are there. Lately, they’re starting to stay stuck until I pull them out. What’s up with that? I’m turning into my own pin cushion.